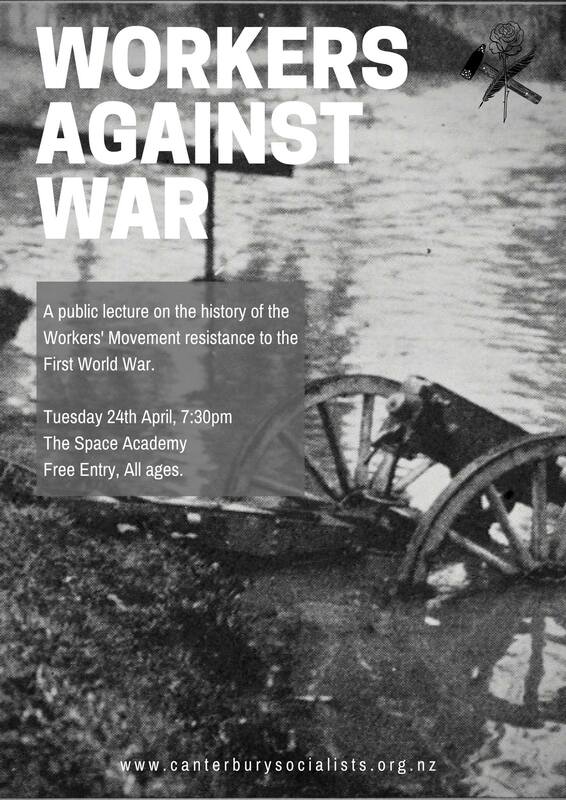 Canterbury Socialist Society presents “Workers Against War” – a public lecture on this history of the Workers’ Movement opposition to the First World War. Every year ANZAC Day commemorations seem more like war propaganda than the last – and we aim to provide a touch of counter history: that of sedition, desertion, rebellion, refusal, and fraternisation of workers on the front. We are very pleased to welcome for a second time guest speaker Dan Bartlett. Dan is a historian whose research with Voices Against War (http://voicesagainstwar.nz/) focused on New Zealand opposition to the First World War. Dan will be focusing on the activities of Socialists in Christchurch during the war years. Socialist Society chair Tom Roud will speak on the tension and eventual split in the international Workers’ Movement over the question of supporting ones’ own ruling class in the war. He will be focusing primarily on the Zimmerwald Conference convened by anti-militarist socialist parties in 1915, as well as the dynamics in the Social Democratic Party of Germany (SPD), one of the largest socialist parties of the time. Rarely acknowledged in official commemorations, working class resistance to the First World War undoubtedly hastened its conclusion. Often maligned by their peers and persecuted by their governments, this event aims to honour the memory of these deeply principled individuals and organisations – and learn from their example. Afterward there will be time for question/answer/discussions, followed by some music and casual discussion. -Ted Howard, The Maoriland Worker, 5th August 1914 p.3.